In addition to space-saving, vertical guide rail systems, the sectional door system is characterized by its low-noise operation, robust surfaces and design diversity. 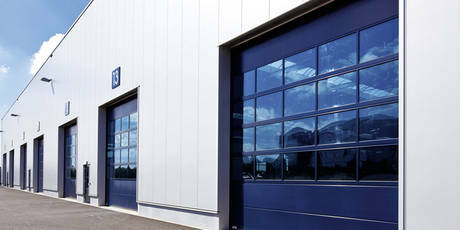 Attractive glazing elements and easy-to-integrate side and wicket doors ensure that most requirements can be met. Intelligent product optimization ensures that installation of our doors is fast and simple, without having to compromise on proven quality. Numerous prefabricated parts reduce the installation time, prevent errors and increase efficiency.